Fred Smith- "I wasn't afraid to lose my money. I knew I was right; I knew I had put this thing together properly and that it was going to be all right." Probably conviction. I was convinced that what I was trying to do with my teammates was important and that it would be successful. The opposite side of that coin is persistence. Very rarely have I ever seen any business or major undertaking that goes in a straight line. There’s zigs and zags, victories and defeat, and you have to be propelled by that conviction that what you’re doing is right and what you’re doing is important, and to persevere in it. That’s probably more important than anything else. I was very convinced that the idea was the central feature of the new economy. That without a system like this, it simply wasn’t going to be able to work. So I was, in every sense of the word, a zealot. I mean, I felt very strongly that this needed to be done, that it was something that would be extremely useful to people and that it would make the economy and the society and the system work much better than it would work absent that. I was very committed to the people that had signed on with me and if we were going to go down, we were going to go down with a fight. It wasn’t going to be because I checked out and didn’t finish it out. I wasn’t afraid to lose my money. I knew I was right; I knew I had put this thing together properly and that it was going to be all right. That was what stood me in good stead. Luck, naïveté, willingness to roll the dice to do something productive, were all individual parts of the puzzle. The reason I never lost confidence is because I never believed that the consequences of losing were as bad as some other people might have thought, you know? “Oh my goodness, I’ve lost my money!” or what have you. I mean, I just wasn’t motivated along those lines. And I was very, very, very sure that what we were doing was extremely important and was destined to be successful. So that’s the definition I think of an insane person, or a zealot. And most entrepreneurs, I think you would find, have that sort of green wire laid in there just a little bit cross-wise. And they begin to get focused on something, and they believe in the idea or themselves far beyond what they probably should. You’ve got to enjoy what you’re doing, and have some fun, and be able to laugh at yourself a bit. Criticism doesn’t bother me. What we’ve tried to do inside FedEx is to say that criticism is a real opportunity to improve. When we do something wrong for a customer, that’s when we really have a chance to learn how to do things better. We’ve made some mistakes from time to time, we’ve gotten criticized. The mistakes have been relatively small, given the overall success of the company. But I’ve never been bothered too much by criticism. Folks are entitled to do that. It’s a free country, increasingly a free world, so let them take their best shot. If they’re right, they may tell you something you didn’t know before. The most important piece of advice that I could give them is to take advantage of the tremendous reservoir of knowledge that’s out there today. Spend some time learning how the world has evolved. There are a lot of good lessons in history, and other peoples’ experiences in the past, that could be exactly the solution to the problem you’re looking for. Particularly today, with everything available on-line and on the Internet, and with quick delivery of books or whatever you need, to not take advantage of this educational opportunity is a real tragedy. I don’t think that there was any one incident that changed my life. It was simply the observation of a lot of people that I admired. I synthesized a lot of things from my coach, my uncles, my teachers in a certain area. I had a marvelous English teacher who opened my eyes to the fact there’d been a lot of people on this planet before my time who might have a thing or two to say that were of use. So, I got a lot of things from a lot of people. I picked and chose. The solution was, in my mind, to have an integrated air and ground system, which had never been done. And to operate not on a linear basis, where you try to take things from one point to another, but operate in a systemic manner. Sort of the way a bank clearing house does, you know? They have a bank clearing house in the middle of all the banks and everybody sends someone down there and they swap everything around. Well, that had been done in transportation before: the Indian post office, the French post office. American Airlines had tried a system like that shortly after World War II. But the demand side and supply side had really not met at an appropriate level of maturation. By the early ’70s when I’d gotten out of the service it was very clear that this new society was coming in earnest. And so, at that point I said, ‘What the hell, let’s try to put it together.’ And that’s how FedEx came to be. And then from that point forward, the requirements for this type of system were so profound and so big, really for the next 25 years to this date we’ve simply been running just to keep up with the requirements. And that’s what led to the hundreds of planes and the thousands of trucks. I wish it was something that I could say I was so smart. It was just like Pogo the Possum said, “If you want to be a great leader, find a big parade and run in front of it.” And that’s what we’ve been doing for the last quarter century. In retrospect it was ridiculous to try to put this system together, which required so much up front money, and required changing a lot of government regulations, but I didn’t know that at the time. And I think probably my experience in the service, where — the currency of exchange in FedEx was just money, it wasn’t people’s arms and legs, or lives. So my perspective on it was perhaps a bit more — I don’t know how you’d say it. I was willing to take a chance, because losing wasn’t the worst thing in the world that could happen to you. I had seen that very clearly. When I first met Sergeant Jackson I had grown a mustache and had taken up the affectation of smoking cigars, because I thought this made me look, you know, quite dashing and much older than my 22 years, or what have you. And the first thing that Sergeant Jackson did after I asked him to, in essence, take the insignia off, you know, just tell me straight up what I could do to improve my performance. And he told me, he said, “Well, the first thing, shave off that ridiculous mustache, and quite smoking the cigars — because you look absurd — and be yourself.” And I don’t think I ever forgot that. I don’t think I ever tried an affectation after that point in my life. He told me I looked like a smooth-faced kid trying to be something that I wasn’t. That stuck with me a long time, to this day. First and foremost the idea was a profound idea, as has been shown. Today we have 170,000 employees and $16 billion. As I said, the requirement for this type of a system was so great and was increasing at the time. I just had the good luck to have an idea that was on the tide of history. I’m sure many other people who’ve been much more successful would say the same thing. Bill Gates was given the opportunity to make the operating system for IBM and then there was a huge explosion of demand for PCs. I wish it were not the case, but an awful lot of success is being in the right place at the right time. That was a very big part of it. Naïveté was also a big part. I didn’t know that I couldn’t do this. It’s everything. I can’t imagine going through life without being able to laugh at things. Even when things get bad, there’s always a humorous side to it. I think it may be the most important attribute somebody can have to get through life, because everybody has tragedy, and everybody has bad things happen. If you don’t have that reservoir good will, or ability to look at yourself with a little bit of humor, I think you’re missing an awful lot of life. That made it very clear to everybody what they need to do every day. We manage the continuous improvement in a mathematical manner every single day. Our service gets better each year. That’s very rare for big service organizations. Most of the time, as they get larger service deteriorates, it doesn’t improve. In certain ways the big challenge for our company parallels the big challenges for the country. Our company has become enormously global in nature. 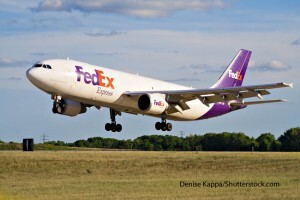 FedEx and our competitors are the primary means of moving the high value-added, high-tech goods around the world. And that’s what’s propelling global growth today. It’s not the growth in mining, and lumbering and agriculture. It’s the growth in electronics, and computers, and new medicines, and equipment and things of that nature. We’re the way those things get to market. We’re the thing that binds everybody else together. And successfully navigating from a mostly national economic structure, to now a global structure with different types of cultures and governments and what have you. I mean, all you have to do is pick up the newspaper and see it every day. And it’s going to be important that the United States and FedEx, every year that goes by, does better in the way we deal with other cultures. And is respectful of other peoples’ points of view and makes a contribution and doesn’t become one of the problems in the world. I would like to sit down some time and put a few thoughts down on paper. I’ve got a few observations that might be useful for someone. It’d be fun for me to do it, and I intend to at some point. Other than that, I enjoy my family, enjoy the business and get to see a lot of the world, so I have no complaints. I’ve had all kinds of adversity, but I think you have to put those things in perspective. I have to go back to my experience in the Marine Corps. My life has been a walk in the park compared to the adversity that a lot of people have seen. I’ve enjoyed every bit of putting the company together. Even the bad parts I learned from. I’ve enjoyed it immensely, and I enjoy what I’m doing today. I enjoy running the company. First and foremost is our corporate philosophy, which we call PSP: People, Service, Profit. If you’re going to run a high service organization, you have to get the commitment of the people working for that organization right at the start. If you don’t, you’ll never be able to deliver at the levels of expectations of the customer. You can’t make people do what’s right. You can lead them, and you can empower them to make the right decision, but if you don’t produce a culture that allows them to do that, then all the rest is just bumping your gums as one of my old business partners used to say. That’s Jim Barksdale of Netscape, by the way, who’s been very successful himself. Our “People, Service, Profit” philosophy insists that our people be treated fairly. If we give good service and we come up with a reasonable profit, we make that a good deal for our employees, with profit sharing, promotions, complaint procedures. If you spend any time looking at the culture of FedEx you’ll find that PSP philosophy is the foundation of everything else. I’ve been very interested in the people who I work with being successful as well. I don’t think we have many people who’ve worked at FedEx, particularly in the executive ranks, who don’t have good feelings about the company. I hope that’s because they feel they were treated fairly and got their shot at glory and opportunity. I think that’s a big part of it. To make sure that the people you’re working with have a chance to be successful. I learned an awful lot in the Marine Corps — particularly about, I think, how to treat people, lead people — which has played a big role in FedEx. A big part of the employee relations systems and all that we have at our company came from my experience in the service. The Marine Corps is the best when it comes to teaching people how to lead other folks. And so, it had a profound experience on me, some bad, some good. When I was in the Marine Corps as a lieutenant, I had come up from a good background, went to a fine university at Yale. I wasn’t exactly exposed to folks that were in the blue collar professions and occupations. And then here I was in the Marine Corps, and became a platoon leader, and I was surrounded by kids like that. I maybe was three years older than they were. I was 21, they were 18. But these were youngsters from very different backgrounds than I was. You know, blue collar backgrounds, steelworkers, and truck drivers, and gas station folks. And there we were, out in the countryside in Vietnam, living together, eating together and obviously going through all sorts of things. I think I came up with a very, very different perspective than most people that end up in senior management positions about what people who wear blue collars think about things and how they react to things, and what you should do to try to be fair to those folks. So in that regard it was an invaluable experience. And a great deal of what FedEx has been able to accomplish was built on those lessons I learned in the Marine Corps. The fundamental principle behind fast cycle or express transportation is that you are substituting your services for other processes. If an electronics manufacturer is going to operate without inventory, or field service engineers are not going to have the parts and pieces to fix things rat-holed in the trunk of their car, then when they need the part or piece, or they need the item delivered to the customer, you’ve got to perform. You’ve got to be able to let them know where this item is all the time. Our management system is built on continuous quality improvement. We decided a long time ago that percentages were not acceptable to our customers. In other words, 99 percent sounds great, unless you’re the one percent who we don’t deliver for. So we never talk about percentages. We built a management system which measures problems on an absolute basis. And the secret is, as traffic or volume increases, the number of complaints have to go down on an absolute basis. In other words, we’ve got to get better and better year after year. We spend a huge amount of money, particularly on the technology, to allow us incremental improvements in every part of the operation year after year, month after month. That’s the second thing that was a big part of our success. As time changed and markets changed and peoples’ expectations changed, we changed with them. For example, when it became obvious that people wanted to interface with FedEx electronically, many years before people were doing this, we built an electronic interface system that allowed them to do business with us. When the Internet came on the horizon, we built versions of that that allowed people to interface with FedEx over the Internet. And now there are millions of people doing business with FedEx every day electronically. We have a culture that allows us to change without threatening the people that work at the company.